Will let you know once the parts arrive. Thanks a lot for your helpful comments and assistance. I was also searching for a new Class D, because I got tired of the heat and the inconvenience of the JLH1969. I ordered the same 2 boards and the power line decoupling module. The PS will be the Meanwell RSP7524 or the 20024 model, I don't know yet. I have both lying around. The volume will be regulated through a 50K Alps pot. An I doing any obvious misakes in my plans? @AudioMech73, did you recieve any of the Chinese goodies yet? Tried them? I have never seen the Signal Selector Relay Board before. I doubt you can hear any difference whether you use the simple selector switch or the more sophisticated board. For the selector switch, you should probably use 22KOhm resistors to ground for all sources. I only see one possible issue: the 50KOhm Alps. 50KOhm at the input of a TPA3118 with high gain may leave hiss. I use 10KOhm Alps. Or, you can lower the TPA3118 gain. I used to have the JHL1969 back in the days where it was quite unique in sound. But, it was bulky and heated a lot. It was surprisingly simple and for that period very performance competitive. Today, it is a reminiscence from the past. They can be fun to try but personally I find that other modern and less impractical constructions can do as well. I took mine apart many years ago but kept the important parts, like the massive heatsinks, for new challenges. NB: How much capacitance a Meanwell will accept at the output from the decoupuling module, I do not know. I have no Meanwell myself. Nigel warned that this could be an issue. Last edited by FauxFrench; 13th October 2018 at 08:02 AM. 22k resistors to ground? What do you mean? Have you got a schematic? What do they do? The 22KOhm resistors serve to bias the output capacitors in the sources correctly (so you don't have a "plop" in the speakers when you change source) if the sources have not already solved that problem. A 230V/24Vac will give you more than 32V when rectified! If you need to use a transformer, it is rather 230V/15Vac you need. Last edited by FauxFrench; 13th October 2018 at 12:23 PM. @peroz I have not received the parts yet. Once I receive them and the whole system has been assembled, I will post some pictures. I first thought about building a JLH1969 system for the unique sound, but the heat sink requirements are a bit crazy and you don't get much output power. Last edited by AudioMech73; 14th October 2018 at 01:11 PM. 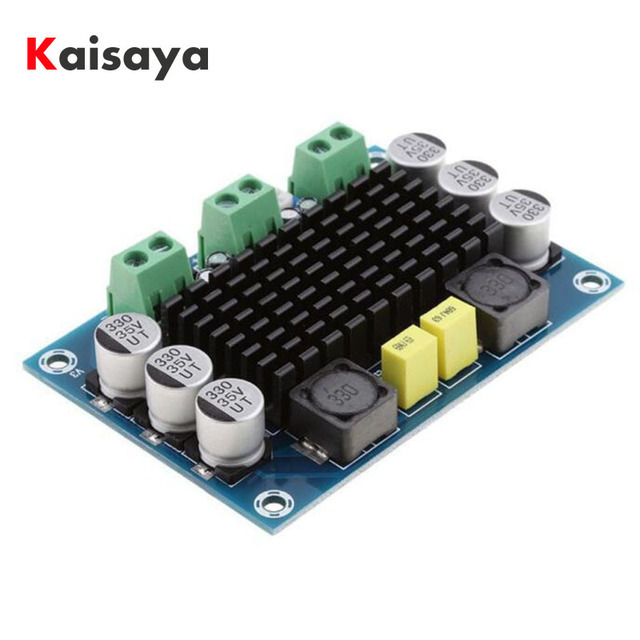 I have used this board for a subwoofer and it sounds fine! \\\ I would not spend much money on the power supply: 24V does not give much more then 19V as 3dB down from max volume allready uses half the power. I like the 19V 3.14A HP laptop adapters best and they seem to be powerful enough even for my 2.1 dual chip board with 2Ohm (pbtl) subs and 5Ohm tops. I received my TPA3116D2 board today. Only one (mono) for test. Nothing to complain about. Started with 12V supply and cheap test-speaker - worked. Then, 19V supply (laptop brick) and cheap test-speaker - worked as well. Finally 19V supply and a good speaker (only mono) - absolutely nothing to complain about with the input tied correctly. As my source is not differential signal, I tied one of the inputs ("-") to ground. No hiss and no hum. Then, for curiosity, I untied the negative input from ground and got noise. I did not try for long because playing with an open input is to tempt Murphy's Law. It indeed needs to be tied if the source is is not differential. I only have one small jumper on the board I am at present not sure what is doing. It is marked with "M" and "GND". All-in-all a fine board at a very attractive price. Good heatsink that can be removed. Assembly standard is average. Last edited by FauxFrench; 16th October 2018 at 11:20 AM. Hello guys, i also got TPA3116D2 mono amp and facing one issue. When i touch input jack it makes buzz noise. Can someone tell me how can i fix it? Tried to put up to 60K resistor between input and ground, but nothing changes. Also tried with ground loop isolator and it did not filtering also. I see no input jack. Which connector do you mean? Did you have an input source connected at the same time? @FauxFrench please check my video. It's 3.5mm jack.